We have been waiting for this for an entire year. We had this same opportunity no less than a year ago and lost it, but we will not let this pass. We will face this opponent head on, take all of their advances and throw them aside. We will push on, we will continue our drive for the cup and we will prevail. This is not a time for meek men, this is a time for the strong to survive and for the strong to triumph over their enemies. Yes I may have had a beer or twelve in my system but my word still rings true, today the struggle begins and today begins the triumph of the PENGUINS! 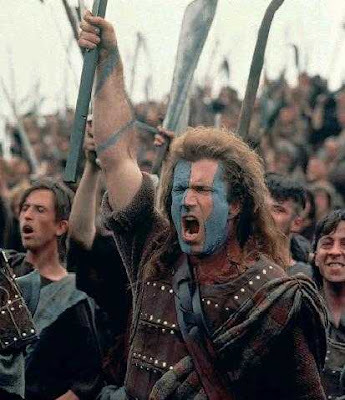 Eight PM tonight cannot come soon enough, but in the mean time I am going to paint my face blue and scream into the night air…FREEDOM!!!!!! !